Beijing has reacted sharply to what it described as “deliberate provocation” by Washington after a US Navy destroyer sailed within 12 nautical miles of the Xisha island claimed by China and two other states in the South China Sea on Saturday. “The U.S. warship violated Chinese law and entered China’ s territorial sea without authorization. The Chinese side conducted surveillance and vocal warnings to the U.S. warship,” Chinese Foreign Ministry spokesperson Hua Chunying said in Beijing. China’s Defense Ministry also condemned Washington’s act of aggression. “The U.S. act severely violated Chinese law, sabotaged the peace, security and good order of the waters, and undermined the region’ s peace and stability,” said the Defense Ministry. A Chinese statement on territorial sea baseline on May 15, 1996 announced part of the baseline of the territorial sea adjacent to China’s mainland and the baseline of the territorial sea adjacent to the Xisha Islands. “The U.S. side is fully aware of this, yet it still sent its warship into China’ s territorial sea without authorization. It is a deliberate provocation,” Defense Ministry spokesman Yang Yujun said in the statement. The Pentagon said on Saturday the aim of the warship was “to counter efforts to limit freedom of navigation”. According to the China’s law on the territorial sea and contiguous zone enacted in 1992, foreign warships entering China’s territorial waters must be approved by the Chinese government. Pentagon spokesman Captain Jeff Davis said the latest US operation sought to challenge policies that require prior permission or notification of transit within territorial seas. “For many years, the US side has proposed measures to ensure navigation safety of ships and aircraft of all parties, but it repeatedly sent vessels and planes into China’ s territorial sea and air space regardless of China’s opposition, leading to close encounters of navy and air force troops of the two countries,” Chinese Defense Ministry Yang said on Saturday. Dr. Sam Bateman who retired from the Royal Australian Navy as a Commodore calls the US moves in the South China Sea “a bad idea”. “The idea that the US may send military aircraft and ships to assert freedom of navigation around Chinese claimed islands in the South China Sea is seriously bad. It’s bad because it would involve an unreasonably assertive interpretation of the international law of the sea, and because it shows such little regard for the impact of such action on regional stability,” Bateman writes in a blog of the Australian Strategy Policy Institute. 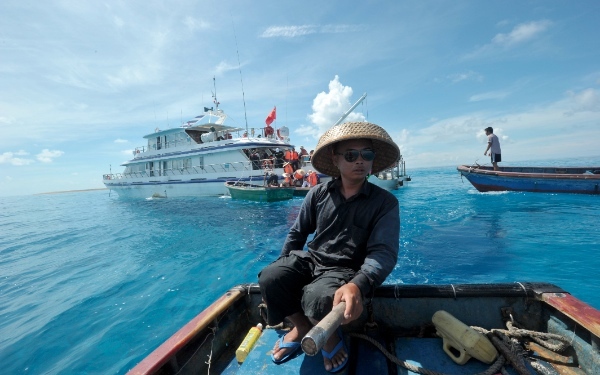 Bateman also asks “what freedoms are being threatened?” in the South China Sea. “China has always said that with freedoms of navigation and overflight, it only disputes the right of the US to conduct military activities, particularly certain types of intelligence collection and military data gathering (so-called ‘military surveys’) in its exclusive economic zone (EEZ),” he adds.